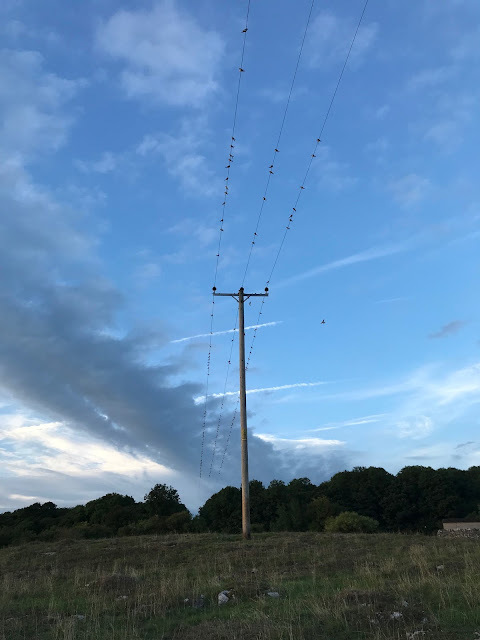 I think I can now safely say that our last pair of Swifts and their family will have departed today (Monday 20th August) or thereabouts on their long journey back to Africa, may they have a safe journey and we eagerly await their return on the 4th May 2019. A summary of this years report to follow shortly. Ed Duckett has kindly sent in this photo which shows a "superlarge" collection of Swallows on the telegraph wires near to Clawthorpe Hall, there is well over one hundred and this has been going on now for a day or two. It's usually a sign of group collecting before their long journey, but its rare I have ever seen them collect so early, its usually more to the end of the month and early September. 2120hrs - Two birds seen on the Royal. One came out from the front LH corner of the Royal Cottage and another was seen to enter the large slit on the rear annexe of the cottage. (both records were seen by Reg and May Hesketh. 2030hrs - Just a single bird above Memorial Hall. 2030hrs 11 birds present in the skies between Memorial Hall and Royal Hotel. 0930hrs 8 birds in the skies, 6 between Memorial Hall and the Royal with another two between the Kings and the Manor House. 2015hrs 4 birds with two above the area Neddy Hill to the Square, and the other two were between the Kings and the Manor House. Our Swifts were much reduced to a maximum count of 14 birds which were very active with the best chasing/screaming party of six birds. Most of the activity was from above the Memorial Hall up to the Royal Hotel areas. Birds were witnessed going into nest sites in Cocking Yard (either Hangings Farm) or possibly the property further along which has all the ivy covering. Also lots of activity on the rear of the Royal in all the regular sites eg: the return, the large slit hole, the small hole above it, and the very large hole above that. Also activity was witnessed on the front of the Royal Cottage with a bird entering the nest site to the far left hand side. Also chicks could be heard from one of the nest sites to the right hand elevations.